The simple rhetoric of the Wisconsin budget battle is that the Democrats are just “thug” unions — and that Republicans are carrying water for wealthy corporate sleaze. It’s more complicated than that. For one, several teachers’ unions endorsed Wisconsin Republicans last year — unions are hardly the unthinking automatons of the left they’re now depicted to be. Why would they do that? Quite simply, those Republicans looked into the face of their constituents… and lied. As the marquee battle over unions and Walker’s bill is happening in Madison, the true fight over changes to the state is happening elsewhere. The ransacking of Wisconsin cannot be done from Madison alone. Governor Scott Walker has furnished the tools, but who will wield them? We’ve sketched a blueprint of how state Republicans lied to their constituents and conspired with D.C.-based wealth-funded conservative think tanks to not only assemble the “tools” needed to dismantle progressive and middle class power in Wisconsin but also how those organizations trained “mechanics” to use those tools to get “free market conservatives” elected to local offices like city councils and school boards — so that then they can begin to dismantle them. It all starts in Sauk county. Walker’s budget targets education for the biggest cuts. The bill takes $900 million from K-12 education (about 9 percent of the budget). A property tax cap prevents districts from making up the money. The bill also cuts hundreds of millions from higher education, targeting everything from the University of Wisconsin system to technical education. It is the most drastic cut to education in Wisconsin history. And those who support Walker’s bill have noted that the state elected Republicans in 2010 — so the current bill should have been expected and everyone should stop whining. While it’s true that the state elected a Republican majority, candidates were specifically asked about union concessions during their campaigns. 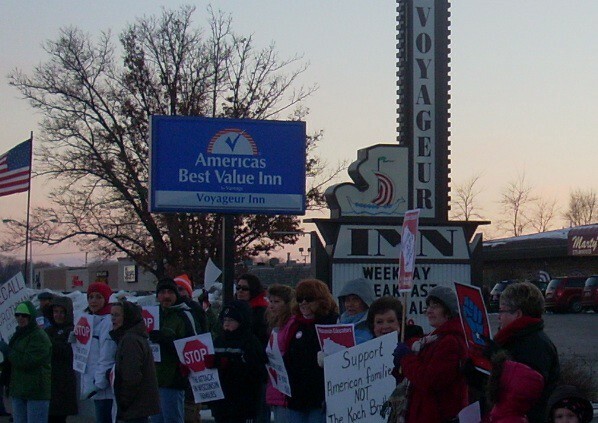 “He lied to us,” said teacher Jenny Fish, as she shivered in the 20-degree chill with 100 other protesters outside Reedsburg’s Voyageur Inn. Inside was the Sauk County Republican Party Lincoln Day dinner, held after its morning annual caucus and afternoon celebration of Ronald Reagan’s 100th birthday. (“Holding the line against Madison.”) Fish was in charge of vetting Representative Ed Brooks (R-50) last year for Three Rivers United Educators. His answers were in part what led the union to endorse him, a Republican, for election. Three Rivers United Educators not only endorsed Brooks, it make a donation to his campaign. Brooks also took money from the Southwest Education Association and the Wisconsin Education Association Council, which is the state’s largest teachers union. Only 3 of the 25 Wisconsin candidates that WEAC endorsed in the 2010 election were Republicans: Richard Spanbauer (R-53), Ed Brooks (R-50) and Dale Schultz, the Sauk county Senator who has been rumored to be breaking with his party. All three won. Fish said that she asked Brooks if he supported removing collective bargaining for benefits. He said he did not. That answer directly led to his endorsement by the labor union. Stephanie Hasler, a French teacher at Reedsburg High School, told me that she and a number of Reedsburg teachers visited Brooks in his office on February 18th of this year. At that meeting, Brooks admitted to not having read the budget bill — and he also insisted that the collective bargaining provisions were not in it. This double-cross is what compelled Reedsburg residents to protest for three consecutive days over the weekend. Stephanie Hasler told me that an impromptu demonstration sprang up on Main Street after negotiations with the Reedsburg school board crumbled. Counting on the new bill measures, the board refused the teachers’ offer of a pay freeze and agreement to the Board’s offer on retirement insurance from the previous contract negotiations, as well as paying the percentages of insurance and pension that the governor wants. Fearing what the Walker bill would allow the board to do, Hasler, along with a dozen other teachers in the district, chose an unplanned early retirement earlier in the week, so as to save their insurance benefits under the existing contract. Reedsburg is a town of fewer than 10,000 people. And with all due respect to the thousands gathered in Madison, openly protesting in a small town, where everyone knows everyone, takes incredible guts. Generally, small-town Wisconsinites are much more comfortable grumbling under their breath about things until they die. 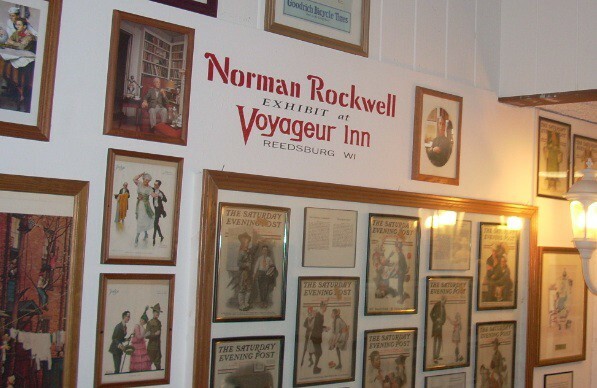 The Voyageur, a wonderful relic from the 1960s, is best known for its collection of hundreds of Normal Rockwell magazine covers, ads and portraits. Attendees of the Republican dinner walked by four of Rockwell’s 1940s covers for The Grade Teacher, the “Professional Magazine for Classroom Teachers of all Grades.” The special guest was U.S. Senator Ron Johnson. Not in attendance: Dale Schultz, the moderate Republican Senator for Reedsburg who has still not confirmed how he will vote on the bill. As far as Wisconsin can tell, he has become a ghost. Joe Hasler, Stephanie’s husband, a longtime state Republican, told me he is “appalled by the party’s recent hard turn to the right.” Joe isn’t just your everyday Republican. Joe was Tommy Thompson’s campaign treasurer — Thompson, who was praised and evoked in Walker’s budget address. One of the reasons moderate Wisconsin Republicans have seen the party slide from their grasp is a massive influx of out-of-state money from groups such as the Koch-founded Americans for Prosperity and the Sam Adams Alliance. Sauk county contains a perfect example of exactly how the corporate takeover on the state level will be implemented on the local level. Walker’s fundamental change to the education system in Wisconsin via funding cuts, tax caps and charter promotion is not that damaging without local level implementation. As Walker has said, his bill is a “tool.” Tools need mechanics. So, in Reedsburg, city officials have floated a solution. They want to move the town’s fire protection charge from tax rolls to utility bills. That frees up around $200,000. For Walker’s plans to be truly effective, there must be those at the local level, like in Reedsburg, who are willing to look people they’ve known all their life in the eyes… and fire them. Now, is that “community organizing?” Because it uses the both those words and sure as hell sounds like community organizing. American Majority brags that it trained 27 city council candidates in Oklahoma and saw 17 of them win. More importantly, the group claims that all but one of those 17 had never run for office before. But despite that claim, American Majority does not actually support Democrats. Currently the organization’s website features a large “Stand with Walker” banner, coincidentally the same motto used by the heavily funded ad campaign from Koch’s Americans for Prosperity. American Majority does partner with such “nonpartisan” groups as Franklin Center’s new venture “Wisconsin Reporter,” which is a PR interest disguised as journalism to seed information — such as the recent poll that claimed 71% of Wisconsinites favor Walker’s budget changes. (See, it’s got “reporter” right there in the name.) The Franklin Center, in turn, is associated with groups such as the Sam Adams Alliance — an outfit that I ran into on Capitol Square a week ago. One of their “grassroots” surveyors was soliciting people in Starbucks for 20 minutes of their time, for which they would be paid $10. American Majority was founded by Ned and Drew Ryun, sons of longtime Kansas Republican Representative Jim Ryun. (Yes, Kansas, home of the Kochs.) Jim Ryun’s federal campaign finance report reads like a list of tens of thousands of dollars from the Kochs, going all the way back to 1997. American Majority was organized by, and receives a great deal of its funding through, the Chicago-based Sam Adams Alliance, which carefully protects the list of its patrons and has gone to pains (though not effectively enough) to remove evidence that it is in large part funded by the Kochs. American Majority is also partnered with Koch organizations that don’t hide the Koch connection at all, like Americans for Prosperity. Sam Adams Alliance is very much funded by the Kochs — but even if they were not, Eric O’Keefe, the chairman and CEO of the Sam Adams Alliance, is also a board member at the Institute for Humane Studies, a group which has received millions from the Kochs and for which Charles Koch is the chairman. O’Keefe is also a board member at the Wisconsin Club for Growth, a state office of the organization funded by the wealthiest of Americans. The Club has become one of the most influential organizations in Wisconsin politics. (The CFG supported Ron Johnson over Russ Feingold and its to-date $320,000 in spending for the 2011 campaign of conservative State Supreme Court Justice David Prosser accounts for about 70 percent of total TV ad expenditures in that election). And Eric O’Keefe lives in Spring Green, Sauk County. American Majority chose the term “mechanics” because this was the name of the first intelligence network put together by independence-minded colonists. The group, whose most famous member was Paul Revere, gathered information on the British and conducted minor sabotage. Explaining the name, American Majority’s pull quote begins “In the days before the Revolutionary War, Paul Revere organized the Mechanics, a group of determined patriots that grew out of the Sons of Liberty.” The unattributed copy is lifted from Revolutionary-war-and-beyond.com. 1. What do you believe the role of government should be in America? 2. Do you have any experience with public speaking and presenting? 3. How do you feel about the “Birther” issue? 5. What do you hope to get out of becoming an authorized American Majority Mechanic? 7. How well do you know the Constitution and Declaration of Independence? 8. What do you believe are the most important political issues this country is facing right now? 9. Who is your political hero and why? 10. Please list all websites, social networks, and blogs in which you have a presence. 11. How comfortable are you with public speaking and presenting on a scale of 1 to 10 (with 10 being very comfortable)? 12. How comfortable are you with technology on a scale of 1 to 10 (with 10 being very comfortable)? 13. How comfortable are you with social networks, including Facbook, Twitter, and YouTube on a scale of 1 to 10 (with 10 being very comfortable)? 14. Please list at least two professional references and their contact information so that we can talk with your peers. The mechanics program is a bit like a franchise. 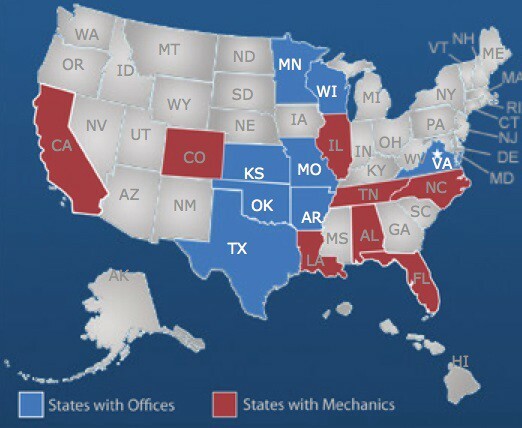 American Majority “mechanics will receive 75% of the net from their trainings” and the 2010 program required mechanics to perform at least one training per month, for a minimum of 30 trainees through the end of 2010. At $20 per person, that’s a minimum take for the mechanic of $450 per month. I attempted to attend the $20 per head training in Madison on March 5th but it was booked solid. The mechanics program was put together and began recruiting in February, 2010. Formal training took place March 24th to 26th, with American Majority flying recruits to Washington D.C., covering all travel and board. And then the Sauk County Tea Party was founded on June 17, 2010. Later in 2010, the Sauk County Tea Party began linking to and endorsing strategy meetings with American Majority. In mid-December of 2010, the group took part in a strategy call with co-founder Ned Ryun to discuss the New Leaders Project. On December 29th, Sauk Tea Party President John Meegan announced his candidacy for Baraboo school board. Fight Back Wisconsin counts the Sauk County Tea Party as part of its “Prosperity Network.” Fight Back Wisconsin and Kochs’ Americans for Prosperity-Wisconsin’s share an address on South 70th Street in Milwaukee. In the February primary, Meegan received more votes than any other candidate. Next up, the April 4 general election. So, to review: In 2010, the Club for Growth and the Koch Brothers heavily supported the election of Scott Walker. Union-busting legislation is written for Walker to submit in 2011. Meanwhile, Club for Growth and Koch Brothers trustee Eric O’Keefe’s Sam Adams Alliance launches the American Majority New Leaders Project, which, in 2010, partners with the Sauk County Tea Party, to train free market conservatives to run for office. Those candidates include Sauk County Tea Party co-founder John Meegan, who announces in December, 2010 that he is running for a seat on the Baraboo school board. It’s almost a given that the John Meegan-Eric O’Keefe example is but one simple detailed example of something that is no doubt going on in all contested counties across the state… and more. Scheduled American Majority training events in the near future include Waxahachie, TX, Crowley, LA, Outer Banks, NC and Bowling Green, KY.
Why does this favored metaphor disintegrate when it comes to targeting cuts to balance that budget? When “most families across this country” are faced with making spending cuts, the one cut they make last of all is to their children’s future. But that’s exactly what Scott Walker and Wisconsin Republicans are doing. In an attempt to balance the family budget, the governor is looking first at what he can cut from the children’s schooling, so that he can keep the premium cable channels. Correction: This piece originally noted that the “New Leaders Project trained 27 city council candidates in Oklahoma and saw 17 of them win.” AM launched the “New Leaders Project” at the end of 2010 for the 2011/2012 election cycle. Those successes in OK were achieved through an unnamed program. Abe Sauer can be reached at abesauer at gmail dot com.